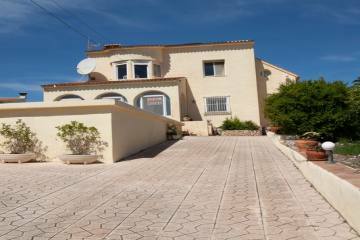 Stunning Villa for sale on a flat plot on two levels with beautiful open countryside views. The covered terrace greets you at the entrance level (overlooking the pool and garden) that leads directly into the living room with wood burner, dining room and a well-appointed galley style kitchen. There are two bedrooms, one with doors opening to the garden, a family bathroom with a further bedroom and en-suite. A spectacular internal staircase directs you to the upper level to a turret bedroom with ensuite and open terrace for relaxation and appreciating the beautiful views. The low maintenance garden offers the pool with electric heating and a pool cover.